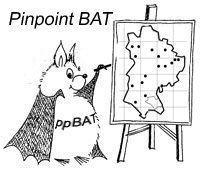 But for those of you who get thoroughly infected with the bat enthusiasm virus there is also an opportunity to attend specialised training sessions. This is planned for daylight hours., so people can see what they are doing. In the past we have shown people how its done on evening trapping sessions, but there is alwaysa rush to get set up. This will be more leisurely. A number of brave souls have been trying to get to grips with this fienidsh mapping tool. Not for the faint hearted. This will be a form of masterclass and presupposes some swareness of how QGIS works. We organized two training sessions in Parkside Hall Ampthill. We have chosen this venue as it is in close proximity to Ampthill Park, which is a good site for bats. This would also suit people who are new to bats and bat detectors. 2. An introduction to sonogram analysis. This is again based at Parkside Hall, but will not involve an outdoor component. We were going to run this session for people unable to make the same course last year, but it is open to any-one. Bob will do some basic theory on bat calls and sonograms. Then you will be set free on some recordings (including some made in Ampthill Park at the previous session.) We will be using a free software program called TF32, which you can download onto your computer. You need to bring your own laptop,and a power cable. (if you do not have a laptop we may be able to lend you one for the evening). Tea and coffee and of course cake will be made available at both sessions. There will be a limited number of places. Please contact Bob at rgcornes@gmail.com. For the second session let him know if you have a laptop.